Available in three widths, our Amish Urban Flat Screen TV Stand will hold your television, electronic equipment, DVDs, CDs, and more. Clean line design and heirloom quality construction join to create a contemporary piece for your living room, office, bedroom, or den. 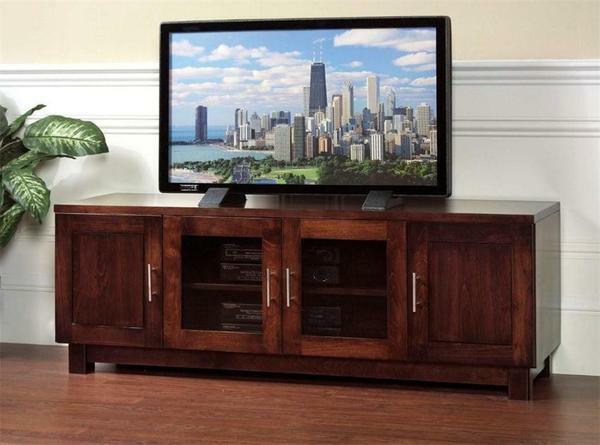 Custom made in the wood type of your choice, this TV stand comes standard with two solid wood doors, and two center doors with glass. Behind the glass doors sits an adjustable shelf, and behind the wood doors, you will find four DVD drawers that will help you keep your collection organized. Along with wood type, choose the hardware, size, finish color, and soft close doors and drawers to really make it yours. Width: 50", 55" or 60"